The Plaque and the Sculpture are at the Rose Gardens on Southsea Seafront, the former training base for the Cockleshell Heroes. 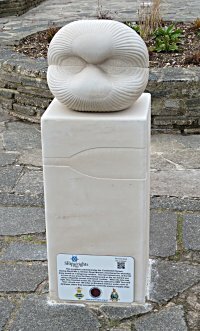 The plaque is on one of the pillars of the northern entrance facing Eastern Parade and the sculpture is at the southern entrance between the gardens and the beach. This plaque provided by Portsmouth City Council was unveiled by Marine Bill Sparks DSM on 6th July 1992. In the presence of the Lord Mayor of Portsmouth Councillor Jim Patey and the Chairman of the Leisure Committee Councillor Syd Rapson BEM to mark the 50th Anniversary of this site which was used as a training base for the Royal Marine Boom Patrol Detachment formed on 6th July 1942. This secret unit trained on the Solent for raids by canoe (Cockles) on Europe. The most famous raid was on German shipping in Bordeaux docks. On 11th December 1942 by ten members of RMBPD only two of these Cockleshell Heroes returned. This sculpture commemorates the 'Cockleshell Heroes'. darkness, where they successfully mined the enemy's supply ships.